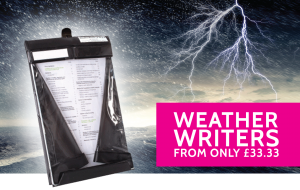 If you haven’t already been blown away by Storm Imogen, then prepare to be blown away by our amazing Weather Writer Clipboards. These all-weather clipboards have a spring-loaded clear top allowing you to read and write on your notes, whilst protecting them from the wind and rain. Click here to few the full range online – available in Portrait or Landscape; Black or Red; in A4 or A3.